Are we entering a dark age of Christmas pop culture? Some might argue that we already have. Christmas has always been a magnet for writers, artists and musicians seeking to put their stamp on the western world’s most beloved time of year. Some have done it for the love of the holidays, or simply because they are inspired (and of course more than a few have done it to make a quick buck). But what’s unusual about Christmas pop culture is that it lasts. For a REALLY long time. This is due in no small part to the fact that there is an entire month (or more) entirely dedicated to promoting holiday culture. Great books, great songs and great movies may capture the imagination of a generation or two before they fade into obscurity. But not it its A Christmas Carol, Jingle Bells, or It’s a Wonderful Life. Those will likely stick around forever. 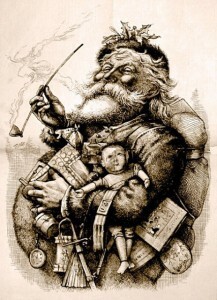 Since the early 19th century, and especially into the mid- to late-20th century, Christmas has seen an annual crush of pop culture as new entries jostle to find a permanent position in the great pantheon of holiday tradition. This trend reached its crescendo from the 1940s through the 1990s. Beginning in 2007, right at the beginning of the Great Recession, the onslaught came to a sudden and dramatic end. There has not been a television holiday special of significance since the 1990s, except perhaps the Stephen Colbert Christmas Special in 2008 and Buddy’s Musical Christmas in 2014. There has not been a major new pop Christmas song hit since 2000 (not including covers). And the only major holiday movie release in the last ten years that has gone mainstream has been Disney’s A Christmas Carol. Looking at the major contributions to Christmas pop culture since the year 2000, it is clearly becoming evident that things are starting to slow down. Maybe it’s the increasingly secular nature and feel of the holiday is having an impact. Maybe the advent of the internet is making things too unprofitable. Maybe the giant annual parade of Hollywood blockbusters is simply squeezing out rival films. Maybe there’s enough material available for television to last a lifetime. Maybe it’s the ‘war on Christmas’. Whatever the reason, the trend is undeniable. The most recent addition to leave a truly lasting mark on the holiday season is probably the movie Elf, which is already over a decade old. For the moment, it feels like the new market is being surrendered to the annual parade of cookie-cutter made for TV specials on the Lifetime and Hallmark channels. This is fascinating! I really enjoyed the article! And I saw one nice post last week and thought it was awesome too. It is about the history of the creation of the modern image of Santa Claus we now can find in shopping malls, greeting cards and commercials that was created by Coca-Cola campaign in 1931.